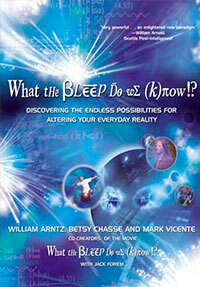 What the Bleep answers this question and others through an innovative, new approach to self-help and spirituality that’s far different—and more exciting—than anything else on bookshelves. More than twenty short, focused, interactive chapters take readers on a journey that will integrate the answers to these Great Questions into every aspect of their lives. William Arntz, a research physicist and spiritual seeker, created one of the world’s most widely used pieces of software. He retired and became interested in uniting his four great passions: leading edge science, spiritual inquiry, filmmaking and computers. Betsy Chasse freelanced as a Production Manager on over thirty films and produced eight movies before deciding that she wanted to move away from Los Angeles and do something more meaningful with her life. Mark Vicente is a cinematographer turned direflector with a special interest in mysterious, reflective and unusual subject matter.